Get more from Microsoft Access in just a few hours. Save time recreating the wheel – UI Builder gives you all the essential features Microsoft Access should come with out of the box. Used by small companies, governments, and Fortune 500 corporations worldwide, UI Builder is the must-have Access tool for any database. Use UI Builder to add professional web 2.0-like menus with configurable layouts and color schemes. Simplify user navigation between your forms and reports. 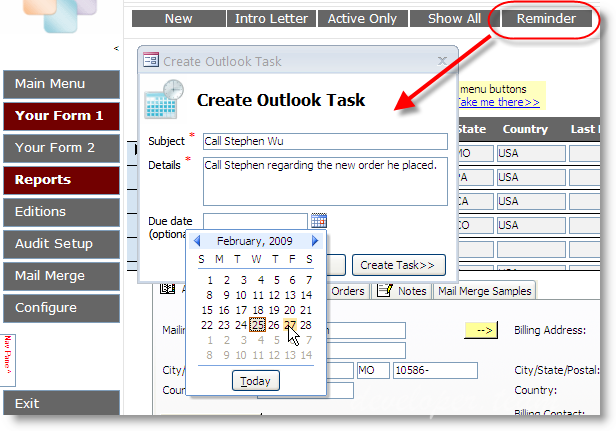 Even add a Google-like search feature to the top of your Microsoft Access forms without any VB coding. Make each project unique: change your menu buttons, layouts, and colors without code. Capture errors with UI Builder’s built-in event logging, automatically fix broken linked tables, and maintain user-friendly directories of forms, reports, and queries with clear descriptions. And because UI Builder is compatible with MS Access 2000 through Access 2007 and MS Access 2010, you have one tool that will upgrade with you.